Heat rises for a fact. If you go up into your attic space on even a moderate, eighty-degree day, it could be as hot as one-hundred inside! That’s why most home roofing industry experts agree that cooling your attic with attic fans and good ventilation not only saves on energy costs, it also extends the service life of major components such as roof framing and trusses, insulation, venting, electrical wiring, plumbing and others which are often located in a home’s attic space. In fact, more and more new homes are being built with whole house fan systems that efficiently cool dead air spaces to keep heat from building up and damaging house components. If you are building a new home or doing major remodeling and renovation on your existing home, consider installing one of these systems. The return on investment case is compelling, especially in larger homes or homes with lots of gables or other complex roof design features. The attic acts as a buffer zone or transition between your home’s interior and the outside world. Ideally, you want to regulate the temperature in this buffer zone in order to maintain a more constant temperature inside the living space. Insulation, air-vapor barriers and adequate ventilation alleviates undo burden on your heating and air conditioning system. Attic insulation retards the upward movement of heat, keeping your home warmer in the winter months and helping retain the cooler air inside during the summer months. The air-vapor barriers (typically plastic sheets or built-in paper or aluminum foil facing on the insulation panels) help to keep moisture that rises up from inside the home from penetrating the insulation. Attic and roof ventilation is important to regulate the moisture and temperature levels as the seasons and weather conditions change. 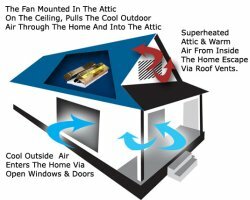 When it’s cold outside, air leaks around light fixtures in the ceiling, attic access panels, exhaust fans, etc., bringing moisture from inside your home into the attic space; simply going into your attic to get something down can significantly increase the moisture level as all that warm moist air rises up through the open access panel. Many older homes have gable vents, which are screened and louvered vents located up near the roof peak in the side walls of an attic. While they help keep the uppermost airspace in the attic cooler, gable end vents often cause hot spots where air may be motionless. If you have a home built before 1980 with gable vents, installing a fan helps eliminate these hot spots and keep things cooler. Using a combination of ridge vents and soffit vents (required the roof to be designed with overhangs, called soffits) can provide an adequate non-mechanical venting. However, most roof designs do not allow for adequate non-mechanical ventilation alone to be optimal. The temperature in your attic can get as high as 150ºF if you don’t have an attic fan. The fan creates a steady air-flow through the attic space without the excessive use of passive venting. If too much air flow is exchanged between the attic space and the outside, moisture from snow and rain can infiltrate. If you live in a particularly wet area, consider installing a humidity control system in your attic as well to prevent moisture problems. Attic fans can be electrical or solar powered and two types are most commonly used; roof top and gable end. Electric attic fans are cheaper and more powerful. Solar powered models are more costly, but you will have the peace of mind that you are doing a little something to help leverage green electric power! Use only the higher quality attic fans that have integral flashing made for the type of roofing material used on your roof. The attic fan(s) you install should have a quality thermostat to control operation automatically without the need for frequent resets and a firestat, which shuts the fan off in case of fire. Avoid plastic; fans with all metal construction are the type to buy. Look for a model with solid screens to keep pests out of your attic space. In more and more cases, people are beginning to use whole house cooling systems as an alternative to traditional home air conditioning. These systems work well in places where the climate is moderate and generally remains below 82 degrees F. In these conditions, a whole house fan system can be effective. Such systems are sometimes used in older homes where it would be too costly or difficult to install a central air conditioning system. Noise can be a problem with whole house cooling, but if engineered correctly the system should run efficiently and quietly. Fans with more blades will be quieter than ones with fewer blades and mounting the fans with foam or rubber strips helps reduce vibration and sound. In a home with gable vents and no soffit vents, installing soffit venting can greatly improve air flow in the attic space. Continuous soffit vents are difficult to retrofit, so the easiest solution is simply to install circular aluminum gable vent fans, available in a variety of sizes and easy to install. Adding a ridge vent will further improve air flow as will the addition of vents placed lower in the side walls of the attic, which helps eliminate hot spots. Do not let attic insulation come into contact with the roof or cover soffit vents and be sure to leave plenty of space around attic vents and fans to promote efficient air movement. If you have tried these tips and still find the air space in your attic is significantly warmer than outside temperatures on hot days, you might want to consider adding mechanical ventilators. Installing the gable mounted ventilators is simple to do yourself and will help enhance air flow. You will need to wire them for electrical power, but otherwise the installation is very straightforward. Some models have a self-opening shutter, which helps keep flying insects, small birds and bats out and unlike the units mounted in gable vents, these do not force air through the gable vent, but rather through the shutter itself. You can install either powered or un-powered roof ventilators to enhance air flow inside the attic. The un-powered type use turbines which will spin in even a light breeze, causing an updraft to expel hot air from the attic. Powered by electricity, the powered roof ventilators work best if you don’t get a steady breeze. Rust-proof aluminum or ABS plastic is the best choice for your roof ventilators, since they won’t rust like steel models. 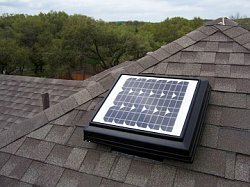 If your roof faces south and you live in an area that gets a lot of sunny days, then solar powered ventilators can be quite effective and are easiest to install since no electrical wiring is needed! Content copyright . PULSEELECTRICCOMPANY.COM. All rights reserved.